Yesterday, when I woke up to walk the dog and do my early day writing, the temperature outside was negative ten degrees. That’s -10. The day before, at same time, it was negative 14. That’s -14. The wind chill factor made Sunday feel like negative 30. That’s … well, you get the picture. Cold. Wicked cold. This morning, at the same time, it is 25 degrees and rising. Later today, it could reach 50 degrees. That’s about a 60 degree swing towards warm from yesterday morning that might happen. Mother Nature is going bonkers on us here in New England, and the evidence is not just the temperature but also the coat of ice on top of an inch of snow on the driveway. Shoveling will not be fun. Good thing we are on our winter break right now. I sure hope Mother Nature settles down into Spring soon. Right? Right? Kevin, it’s hard to imagine record colds like in New England. Long Island is swinging on the pendulum too. Snow and cold yesterday to wake up to no snow shoveling – snow melted by the rain I guess. 3 groundhogs said it would be an early spring. 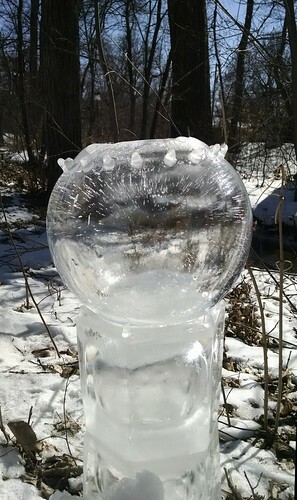 Mother Nature trickery (want to write about that for my upcoming gallery, Winter Wandering)? My sister lives in Canada. While we had a cold snap in Oregon in November, they were hoping snow would come for Christmas. Now, we have the balmy weather and they, like you, are enjoying deeply frozen temperatures. They are planning to drive to Myrtle Beach for Spring Break. I really can’t imagine. That kind of cold. Yikes. We are dealing with rain, rain, rain but haven’t seen snow in forever. Mother Nature is going bonkers down here too. We had planned to go to the Lititz Fire & Ice Festival over the weekend, but had to abandon the idea since it was too frigid. This weekend, it’s going to be 52 and sunny. Something inbetween would be fine with me! We have the same weather…freaky, really. Lower New England here, I know how you feel. While today was not as cold, we had some wicked wind and rain today. I too am hoping Gaea and Demeter get their acts together and give us an early spring. Keeping fingers crossed for us both. I love your post and if you made the awesome snow sculpture then you are a pro, if not then your still awesome!! !